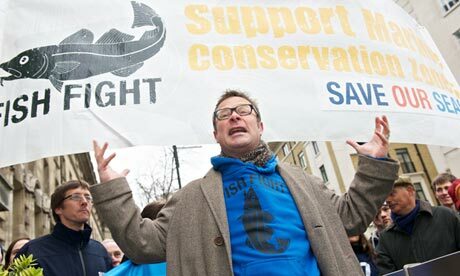 TV chef Hugh Fearnley-Whittingstall led a march to Westminster on Monday to urge the Government to do more to protect UK seas. 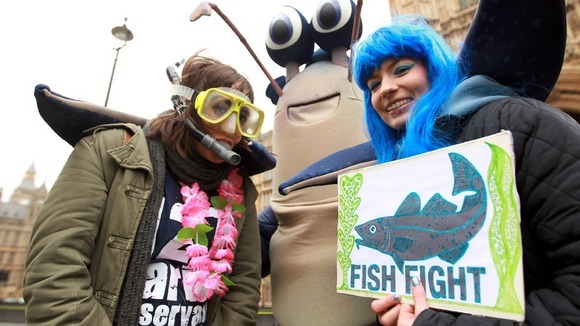 He was accompanied by hundreds of supporters, many in fish-related fancy dress, waving banners and placards that urged ministers to increase the number of marine conservation areas to give badly damaged habitats and depleted fish stocks a chance to recover. The march gathered outside the Houses of Parliament, calling for the creation of 127 marine conservation areas. The Department for Environment, Food and Rural Affairs has so far planned to create 31 sites by the end of this year, but the celebrity chef warns this is not enough. 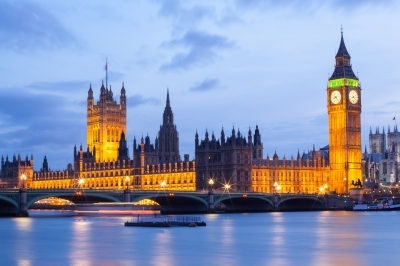 Celebrity chef and food writer Fearnley-Whittingstall will be leading a march on Parliament at noon on Monday, 25 February, to persuade ministers to put in place a wider network of marine conservation zones, where fishing would be effectively banned. The seas around the UK cover 700,000km and yet only 8km are fully protected from all forms of fishing. Less than 10km are protected from the destruction that is caused to the seabed by the heavy iron teeth that are used to dredge for scallops and the metal chains of beam trawls. 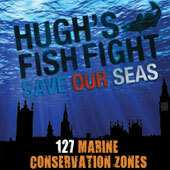 The march is calling for the creation of 127 marine conservation areas and will set off from the London Aquarium at 12 noon and will be filmed for his new Channel 4 TV series, Hugh’s Fish Fight. 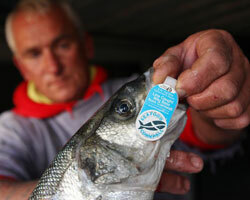 Organisations taking part will include Greenpeace, the Marine Conservation Society, Sealife and the British Sub-Aqua Club. The chef, who started his Fish Fight campaign two years ago, will highlight the destruction of our seabeds in his new series, starting tonight at 9pm. The first episode will show how the huge metal ploughs used on scallop dredges tear up all life, rocks and seaweeds on the seabed. Booths supermarket has already pledged to stop selling dredged scallops and will stock only scallops that have been dived for, which does not damage the surrounding area. Fearnley-Whittingstall is hoping to replicate the success of his campaign against the discarding of healthy fish at sea under the EU’s fishing quotas. Discarding results in about half of the fish in the North Sea alone being thrown back dead, even though they are edible and healthy, because they are caught by vessels that have exceeded their quota. He has got the support of celebrities like Stephen Fry, Coldplay and Ricky Gervais, as well as several supermarkets, including Sainsbury’s and Marks and Spencer.